Women with perfect hair, crystal bright teeth, full lips and botoxed faces. Men in sleek suits, driving around in luxury vehicles and investing millions of dollars in yachts and real estate. That’s the surreal image we see on TV every single day. In 2013, Fox TV channel challenged the stereotype of rich Russian people in London with the documentary series Meet the Russians. Normal, average people are faced with the way multimillionaires achieved new heights in their ability to scatter huge amounts of money on self-centered bravado. Some viewers perceived this show as satire, but the sad truth is that the characters were more realistic than anyone could hope for. Despite the fact that we have no problem judging rich and famous people for their whims and outrageous lifestyle, we still enjoy watching these characters on TV and in movies, and we always cheer for the love story between the poor girl and the prince. Why do we despise most of these people’s actions, but still enjoy witnessing their lives on TV? Our consumerist society is the main reason – we have replaced real values with the race for wealth and prosperity. When I was young, the questions that held me awake at night were how and why. In the world of adults, a different question is prevailing over all other issues I face: how much? On the journey of life, some people decide to fight for their dreams, while others end up in places they never expected to be in. There is one force that drives everyone forward: the goal for secured existence. It doesn’t matter whether I want to travel, get a new car, take care of my health, get an MA degree, or save the world - all of my dreams are determined by the same issue: how much money do I have? It seems like the accumulation of wealth can solve most issues an average human being is facing nowadays. Those rich people on TV can easily attend any prestigious university, eat at the best restaurants, stay in luxurious hotels, and travel the world in their private jets. Money can’t prevent them from getting sick and losing the people they love, but they can certainly pay for expensive health care and do everything in their power to take care for their family. Life is more complicated for the rest of us. As the grandeur of the untouchables creates greater impressions through the movies and TV shows we see, the gap that separates the rich from the rest of the mankind becomes even greater. We want to know what the internal structure of this high society is. We wish to find out more about their role in the entire society, and we constantly compare their whims with the average lives we are living. Nevertheless, we are fully aware of the flaws all these characters have. Arkady Novikov, an owner of successful restaurant and a millionaire, captured the essence of most people’s opinions with a simple statement related to the show Meet the Russians: “I think it is not right. It’s like a disease people get when they have money. I don’t want to be associated with this thing.” When we see rich people on TV, we notice that most of them are spoiled, unkind, rude, and even stupid. Compassion and empathy are overshadowed by the empowering aura of superiority. We see that these people are ready to approve other people’s bad and fraudulent behavior, but they are also ready to act in a similar way. The modern economic theory is based on the notion that rational individuals strive to maximize their own utility. That may or may not be the right definition of human nature, but most people agree that earning money is a useful goal to have in life. Rich individuals are driven by the motto that time is money, so their lack of interest for other people fits into their lifestyle. We like watching wealthy people on TV not only because we wish to have the lifestyle they enjoy, but also because we enjoy identifying their flaws and proving to ourselves that they are not perfect. It seems like the life under a crystal bell deeply affects a person’s ability to develop emotional connections with other people. The ordinary individuals in society are not as cold and corrupted as the stereotype of the high class depicts rich people to be. That comforting realization makes us content with the good things we have in our lives. 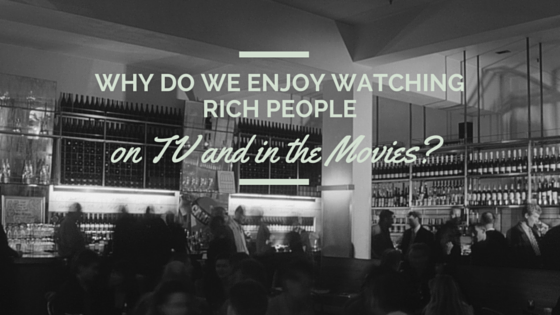 Still, part of us wants to be like the outrageously rich people we see in TV shows and movies. We study, work, and do everything in our power to earn more money. These people have achieved the goal the entire humanity is moving towards. Our consumerist society has created the ideal that money, status, and prestige are the main factors that determine the level of success an individual achieves in a lifetime. With honorable exceptions, the wealthy individuals we see on the screen are unethical. They are everything our mothers taught us not to be, but they have still achieved some of the most important goals people strive for: fortune, luxury, and comfortable life. The main question is: are rich people unethical because they have a lot of money, or did they earn a lot of money because they were unethical in the first place? I believe that most people are good in their nature, but excessive wealth spoils them. When someone has a lot of money, he becomes less dependent on others. When he needs something, he pays for it. Therefore, a rich individual can become less sensitive and empathic. Money is like a disease: when we get enough, we always want more. We discover new needs and we want to satisfy them on a whim. We don’t know how the rich people in reality shows behaved before gaining their fortune, but we witness their greed and we recognize the fact that the biggest problems in our world result from the gap between the high class and the rest of the society. We still enjoy watching movies and TV shows that depict the shocking lives of rich people, because the capitalist system, based upon the principles of working and making money, imposes the goals they have already achieved. The only conclusion we should come down to after watching such movies is that instead of striving to earn more money and achieve social progress, ordinary people should strive to obtain more reason.